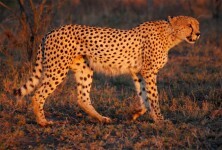 The cheetah is a large cat with spots and a long tail. The head is distinctive in that it is quite domed, short, and thick. 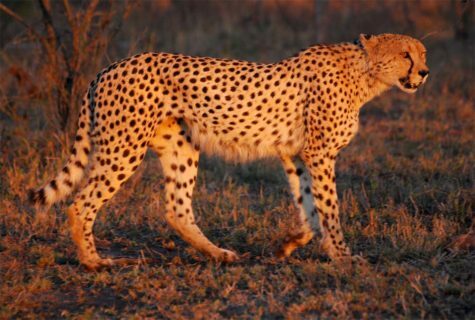 Adapted to high-speed chases on the ground, rather than climbing, the cheetah has long, slender legs and non-retractable claws and digital pads not conducive to gripping. 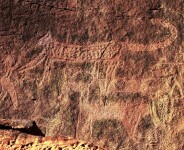 As such, they are portrayed in the rock art standing on all fours, like a dog, rather than climbing or crouching. 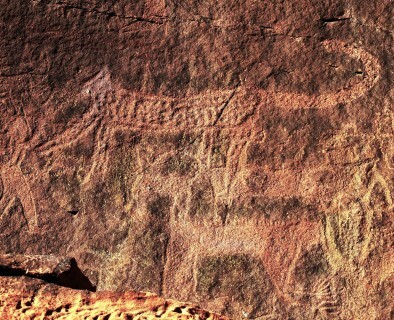 At least three felines are depicted in Saudi Rock Art, the lion, leopard, and cheetah. Of these, the cheetah is the rarest. We identified one clearly identifiable cheetah at Shuwaymis, although there are other felines that probably represent them. Gazelles and antelopes are a cheetah’s main prey, but they have also been seen eating hares and ground birds. Cheetahs are a threat to small livestock, including sheep and goats, and the young of cattle, camels and horses, but not to the adults of large livestock. Throughout history humans have hunted cheetahs for their coats. Cheetahs are most often found in savannas, so they were probably more plentiful during the Holocene Wet Phase in Arabia. The cheetah is widely distributed over most of Africa, with a concentration in the southern and eastern parts of the continent. Their distribution also once covered much of the Near East, South Asia, Central Asia, and Arabia. It now appears to be extinct in the Arabian Peninsula, since no sightings have been reported since 1950.